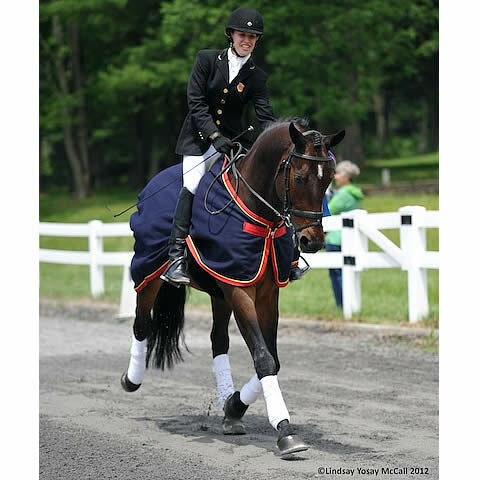 Gladstone, NJ – June 14, 2012 – Rebecca Hart of Unionville, PA captured her fifth United States Equestrian Federation (USEF) Para-Equestrian Dressage National Championship on June 13. Hart, aboard Lord Ludger, owned by Jessica Ransehousen of Blue Hill Farm, inched out 2011 National Champion Jonathan Wentz of Richardson, TX with their Freestyle performance on Wednesday. Athletes from the high performance Para-Equestrian discipline presented their top mounts at the United States Equestrian Team (USET) Foundation headquarters in Gladstone, NJ, June 10-13, 2012. It was befitting to be at one of the most historical locations in equestrian history for the 2012 USEF Para-Equestrian Dressage National Championships and 2012 USEF Paralympic Selection Trials. With the nominated entries waiting to be named for the 2012 Paralympics, four athletes prevailed topping the field of twenty-three horse and rider combinations. The 2012 USEF Paralympic Selection Trials and Para-Equestrian Dressage National Championships was a week of environmental changes including high temperatures one day, a downpour the second day, and a breezy but exceptional weather pattern on the final day. Para-Dressage athletes Rebecca Hart, Jonathan Wentz (Richardson, TX), Donna Ponessa (New Windsor, NY), and Dale Dedrick (Ann Arbor, MI) kept the competition interesting posting scores only thousandths of a percentage point different at times. During the three days of competition FEI Ground Jury members, Carlos Lopes (5*) POR, Anne Prain (5*) FRA, and Marc Urban (5*) BEL evaluated each duo on their interpretation of their respective tests. These critiques were valuable since selected equestrians will see these judges again when they are selected for London. Lopes and Prain are members of the ground jury and Marc Urban is the Assistant Technical Delegate for the Paralympics. Rebecca earned the Championship in the Selection Trials and was declared the top rider at the Paralympic Selection Trials. Since the nominated horse and rider combinations will not be named until the middle of July, the riders are still on the edge of their seats awaiting that list. Earning the Reserve Championship 2012 Para-Equestrian Dressage National Championship accolade was Jonathan Wentz aboard NTEC Richter Scale, owned by Kai Handt of North Texas Equestrian Center. Wentz held the crown for the 2011 National Championship and passed it back to Rebecca Hart who earned it in 2010. Wentz rode NTEC Richter Scale to top the Grade Ib division and earn the second place finish in his grade with Silvano, owned by Dr. Michele Miles. Donna Ponessa also achieved the top Grade Ia rider of the week with Western Rose in first and PG Ganda, owned by Vinceremos Therapeutic Riding Center, in second. Dale Dedrick and Bonifatius earned the fourth place finish in the 2012 USEF Para-Equestrian Dressage National Championship standings and was the second place finisher in Grade II. Four years ago, Carol Grant and Dedrick took a look at Bonifatius who was sitting in a field in Wisconsin. His potbelly and “U” neck made Dedrick tell Carol that he looked like a goat. Carol’s good eye for horses saw that he had a great leg and he had a lot of potential. Grant was correct in her prediction with Dedrick competing all over the United States with the Bonifatius and earning multiple accolades in the dressage ring. Dedrick has been working with trainer Rosalind Kinstler on developing Erik into a technical genius in the dressage ring. Topping the Grade III division was Wendy Fryke, Baker, CO aboard her stallion Lateran. Fryke and Mary Jordan, Wells, ME, performed a hat trick on their horses with Fryke earning the win for her division and Jordan capturing Grade IV with Sebastian. Jordan has had a banner year with Sebastian, owned by Deecie Denison, representing the United States Team on multiple occasions in 2011-2012. Jordan followed in second in the Grade IV division aboard her mare P. Sparrow Socks. Both riders will be looking forward to the announcement of the nominated horse and rider combinations. The 2012 United States Equestrian Paralympic Team nominated horse and rider combinations will be named in the middle of July. Chef d’Equipe Missy Ransehousen will join the named athletes when the riders enter a boot camp before London. The Paralympic Equestrian events take place in London, England at Greenwich Park August 30 – September 4, 2012. To view an online version of this press release with more results and photos, please click here. For more information about the USPEA please visit www.USPEA.org or contact USPEA President Hope Hand by e-mail: Wheeler966@aol.com or by phone: (610)356-6481.